Aiko is a Japanese name that means love child. 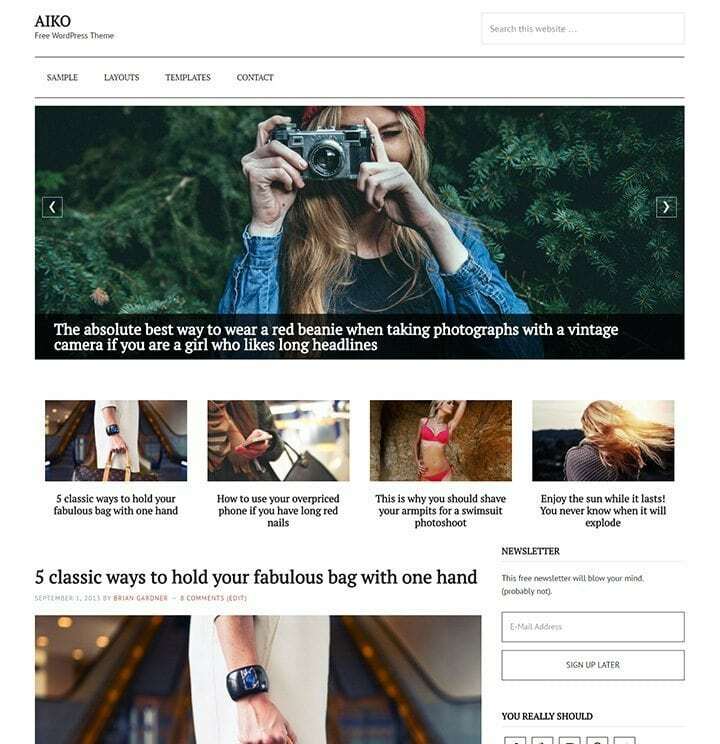 The AIKO WordPress theme is a minimalist, black & white theme, great for fashion blogs, it shines with beautiful photos. It has an After Header widget area (we put a slider but you can put any content there) and 4 widget areas on 4 columns. The 4 columns are only displayed on the homepage. If you don’t add content to these widget areas you can use it as a simple blog theme. You can also set the homepage to be a static page that uses the full-width-content template and you can easily have a business website. A very clean, white business website. Use it and modify it as you like. ** You need to have Genesis Framework in order to use the child theme. Genesis Framework is not included with the theme. where is the demo of the landing page theme and why is there no full width page layout in the options when creating a page? You can select the landing page template or the full-width layout when creating/editing a page, I’ve tested right now and it’s working. That does not seem to work for me. I’ve create a page, Home, and set it to full-width with the landing page template but it is still 4 column. Also, the slider is not using full-width either. I do not have the after-header widget area. Can you give me access to the WordPress admin? But, one of the important widgets places, “Featured Home” did not work for me. When I placed the Genesis slider into “Featured Home”, the slider was visible on every page. Ideally, it should on the homepage only, but no matter what page I visit the slider was there. So, I had to drop the idea of “Featured Home” place. I am still using your theme as it is really classy and it sets itself apart. You can install the Widget Logic plugin – https://wordpress.org/plugins/widget-logic/ – and the widget will then have a field where you can add this code: is_front_page(). The widget will show only on the front page. If you like, you can add multiple widgets in the Featured Home widget area and with widget logic code you can control the where to display them. Love this theme, but I have 2 issues. 1. How can I set the sidebar on the homepage to appear after the carousel? I want the carousel to be full width like in the demo). 2. How to decrease the side space on mobile? I think you have some syntax error in the home featured widget, maybe a < or ), I don't know. That's why the layout is messed up. If you solve that, the side space on mobile will shrink too. If you need it even smaller you can edit style.css, look for the .site-inner rule from the media queries section and modify the padding. Hello, the template is great. The Genesis Bootstrap Carousel plugin is outdated and abandoned for 6 years, is it safe to use it? It is safe as far as I know, but if you want something more up-to-date you can use any other carousel plugin. If it can be displayed in a widget, it should work with the theme.